MALACAÑANG has declared January 21, Monday, as special non-working day in the Autonomous Region in Muslim Mindanao (Armm), Isabela City, and Cotabato City to pave the way for the scheduled plebiscite for the ratification of Bangsamoro Organic Law (BOL). 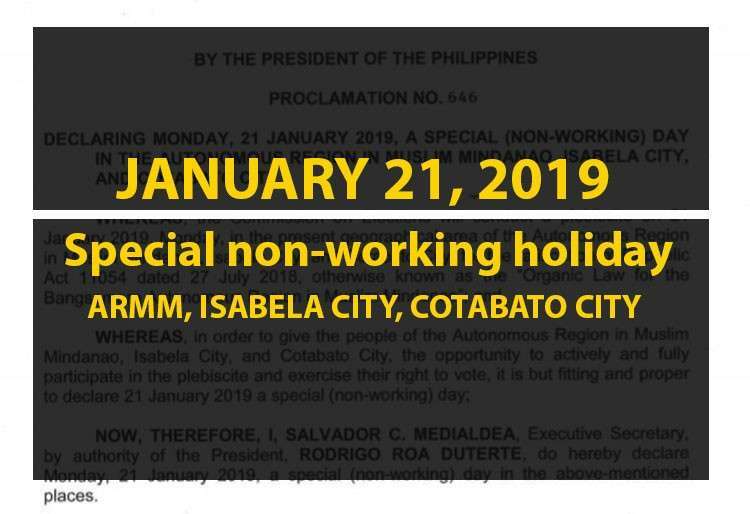 Executive Secretary Salvador Medialdea, by authority of President Rodrigo Duterte, signed Proclamation 646 on January 10, declaring special non-working day in areas where the plebiscite will be held. The proclamation states that the declaration of special non-working day in Armm, Isabela City, and Cotabato City would allow people living there to "actively and fully participate in the plebiscite and exercise their right to vote." "The Commission on Elections will conduct a plebiscite on 21 January 2019, Monday, in the present geographical area of the Autonomous Region in Muslim Mindanao (Armm), Isabela City, and Cotabato City, for the ratificarion of Republic Act 11054 dated July 2018, otherwise known as the Organic Law for the Bangsamoro Autonomous Region in Muslim Mindanao," Proclamation 646 read. "It is but fitting and proper to declare 21 January 2019 a special (non-working) day," it added. The BOL creates Bangsamoro Autonomous Region in Muslim Mindanao (Barmm), replacing the current Autonomous Region in Muslim Mindanao (Armm). The new Bangsamoro region, according to the BOL, is composed of Tawi-Tawi, Sulu, Basilan, Maguindanao, Lanao del Sur, six municipalities of Lanao del Norte, 39 villages of North Cotabato, and chartered cities of Cotabato and Isabela. A plebiscite, which will be held on January 21, is needed for the legal creation of the Barmm.